This story has been updated with fresh information from CD Projekt Red. 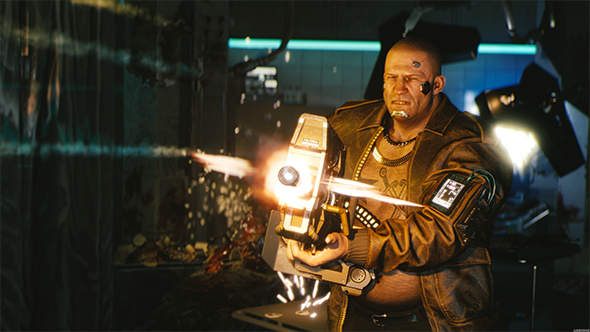 Cyberpunk 2077 might have been one of the most visually striking games to hit our eyeballs during E3 2018, but the latest build is running smoothly on current-gen PC hardware. CD Projekt Red has detailed the rig it ran the gameplay demo on behind closed doors, but despite demo-ing the game on a 4K TV, it has now confirmed it was only rendering at 1080p. Cyberpunk 2077 was easily one of the standout games from E3, and we’ve been waiting for more details of CD Projekt Red’s next RPG masterpiece since it dropped the original teaser bomb way back in 2013. But not only did we get a great new trailer, our Matt got behind the scenes to sit in on an hour of proper gameplay on PC too. Looks like you’re going to need a better screen… Check out our pick of the best 4K gaming monitors around today. When Matt stumbled out into the light of day after his demo he was positive that, given the sheer scale and density of the game world, it couldn’t possibly be running on current-gen hardware. And yet CD Projekt Red has confirmed it’s both shooting for a current-gen release and that its stunning demo was running on pretty standard PC gaming hardware. On the official Cyberpunk 2077 Discord channel CDPR junior community specialist, Alicja Kozera, confirmed the demo was running on an Intel Core i7 8700K at stock speeds, with 32GB of DDR4 memory, and an Nvidia GTX 1080 Ti doing all the graphical gruntwork. Now, that is definitely a high-end PC, but it’s by no means an insane build by today’s standards. 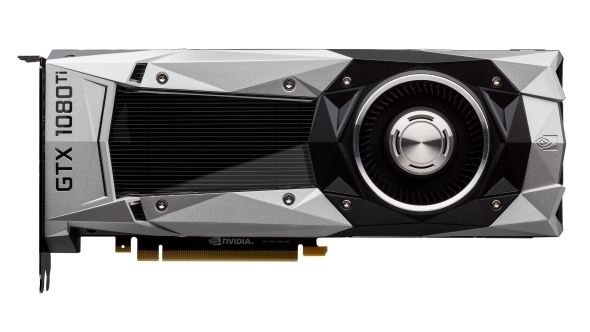 And when the new GTX 1180 cards roll around later this year that level of hardware is potentially going to become a relatively standard build. Given that Matt has said that “it might be hands-down the best thing I’ve ever seen in a videogame” when he saw the initial Night City reveal in-game, you’d have thought to get even the specifically built E3 demo running smoothly at 4K, CDPR would be at least doubling down on the GTX 1080 Ti GPUs, or even speaking nicely to Nvidia and blagging a Titan V. Or two. But now we know the Cyberpunk 2077 demo was only running at 1080p – asconfirmed by Marcin Momotof CDPR – our excitement has been tempered slightly. Matt was confident the gameplay demo was running at 4K, because of the display it was being shown on, and at a locked down, smooth 30fps. But if the heavily optimisedpre-alphabuild of Cyberpunk is only capable of 30fps on an $800 GTX 1080 Ti, that is maybe a little scary. But, that said, I’d rather CDPR was being ambitious about the level of hardware it might demand for its next big thing – and I especially want the PC version to be really pushing right up to the limits of what the best gaming platform in the world can offer. Thankfully at 1080p Matt confirmed there were no frame rate drops, or visible stuttering, in either the massive, high-speed car chase or during the intense combat he witnessed. Obviously, while the demo was played on a “real build” of Cyberpunk 2077, it was always going to be heavily optimised to ensure a smooth experience for the gathered E3 faithful. But the fact that CDPR still managed that with what must be a relatively early build (even with the game possibly launching next year) is a positive. 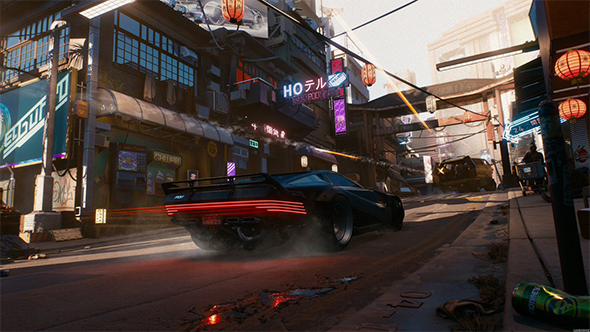 As our Matt points out, however, though Cyberpunk 2077 is running on a massively updated version of the REDengine (version 4), the demo didn’t look as visually realistic as the gameworld of The Witcher 3. That’s partly because it’s got a more stylised, almost 2000AD comic book aesthetic, but also because it’s delivering such a dense environment – in terms of both buildings and populace – that it possibly can’t have that level of fidelity and still run on current-gen tech.